Good evening from Esquire Photography HQ and have I got a totally romantic and gorgeous wedding to share with you! Just a couple weeks ago I had the honour of photographing Marilyn & David’s wedding in Los Angeles & let me just say this was a wedding for the books. Just how we all met is one of those stories that I totally love! I first met Marilyn “virtually” through Facebook earlier this year when I returned from photographing Denise & Miguel’s Wedding in Costa Rica. She had seen my photography on my Facebook Fan Page and we totally hit it off from there. One of the things that I really loved that Marilyn & David did for their wedding – was their attention to detail and the personal touches they put into their wedding day. Like their timeline was totally dialed in. That alone helped make their wedding day so much relaxed and fun for everyone. But that’s only the beginning! Check this out – Marilyn had a blue heart sewn into her wedding dress from David’s Bridal, she had worn her Grandmother’s wedding ring along with her Grandmother’s locket containing a photo of her Grandmother sewn onto her absolutely gorgeous bouquet her mom made! Then there was David & his men looking totally sharp in their tuxedos from Friar Tux and the totally dreamy horse & carriage provided by Enchanted Carriages. Their sunset wedding was overlooking a pond at Porter Valley Country Club, which was, as you’ll see in their photos in the video – creating such a riot of colour for their photos. 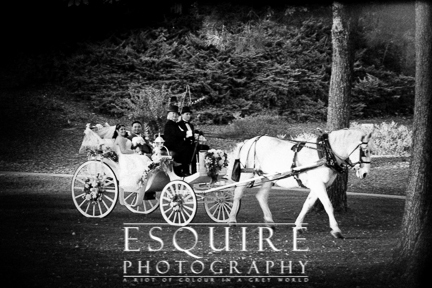 Then after their ceremony, Marilyn & David were whisked away by their horse & carriage for us to be able to have fun capturing portraits with the bridal party along with my signature romantic portraits. Their reception was in the grand ballroom annnnnnnnnnnd that was when the party kicked off. From the surprise dance Marilyn planned with her dad, to the surprisingly teary-eyed honeymoon dance and epic group photo we did with all their friends & family before the cake cutting – Marilyn & David’s wedding reception was an incredible time. I was even able to sneak Marilyn & David out for some of my Signature Night Romantic Portraits during their reception. YEAH! Before you scroll down to check out the video I put together with a few of my favourite photographs & videos I captured on my Canon DSLR AND on Google Glass, and you would like to chat about your upcoming event or wedding – totally comment below or feel free to contact me anytime day or night. I’m available on Twitter, Facebook, Google+, the form on my contact page, or the old fashioned phone as well at 888.ESQ.PHTO (888.377.7486) or 562.225.5915.